Argentina football legend Diego Maradona has had a second gastric bypass operation after his doctor warned that the 55-year-old is 75kgs (11st 11lbs) over his ideal weight. Maradona had his first gastric bypass 10 years ago but has since gained weight and developed complications. "He told me he was feeling fine, that he wasn't in any pain," said Dr Carlos Felipe Chaux after the procedure. Maradona had surgery in the Venezuelan city of Maracaibo. He will stay in the city for at least eight days before travelling to capital Caracas to complete his recovery. He was banned for 15 months after testing positive for cocaine while playing for Italian side Napoli in 1991 and was thrown out of the 1994 World Cup for the use of banned substance ephedrine. He has also struggled with obesity and alcohol addiction. 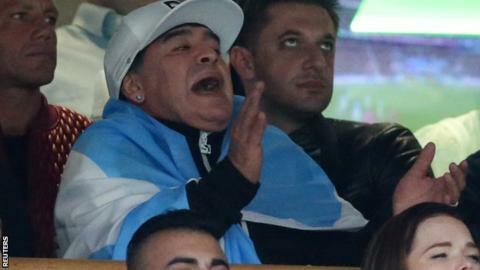 Maradona travelled to England to support Argentina in the Rugby World Cup last month, cheering on the Pumas in their pool match against Tonga in Leicester and semi-final defeat by Australia at Twickenham.